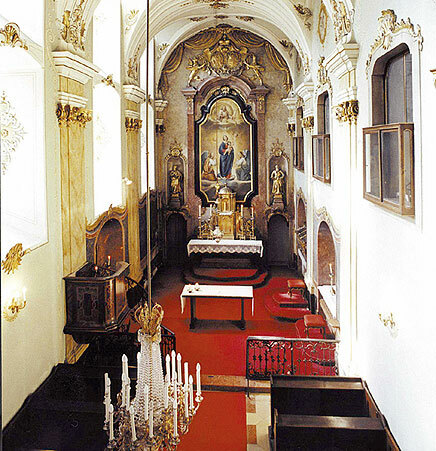 This small, partly carpeted chapel, features heavy stone walls and plastered dome shaped ceilings. A good build-up in the low end, and a smooth tail starting short after the direct sound. The splendid Baroque residence palace built by Carlo Martino Carlone for Prince Paul IV Esterházy (16351713) between 1663 and 1672 transforming the medieval castle. Prince Paul Anton Esterházy (17111762), Prince Nicholas Joseph Esterházy (17141790) and Prince Nicholas II Esterházy (17651833) were the patrons of the composer Joseph Haydn (17321809), who worked here from 1761 for 30 years as court conductor. The precious festival hall, today called Haydn-Saal, was the room where Haydn conducted uncounted performances which were also visited by such famous guests as Ludwig van Beethoven, Franz List, but also by Lady Hamilton or Admiral Nelson.